The track-listing for the forthcoming greatest hits album, "Ultimate Pet Shop Boys" has now been finalised. It includes 25 years of hits from 1985's "West End girls" to 2009's "Love etc." and concludes with a new song, "Together", written and recorded this month. The full track-listing is: West End girls Suburbia It's a sin What have I done to deserve this? Always on my mind Heart Domino dancing Left to my own devices Being boring Where the streets have no name (I can't take my eyes off you) Go West Before Se a vida é (That's the way life is) New York City boy Home and dry Miracles I'm with stupid Love etc. Together The new song was written and produced with former Xenomania staff member Tim Powell and will also be released as a single. The release date will be announced shortly. "Ultimate Pet Shop Boys" will be released on November 1st. It was originally proposed by EMI to celebrate 25 years since the release of Pet Shop Boys' first hit, "West End girls". 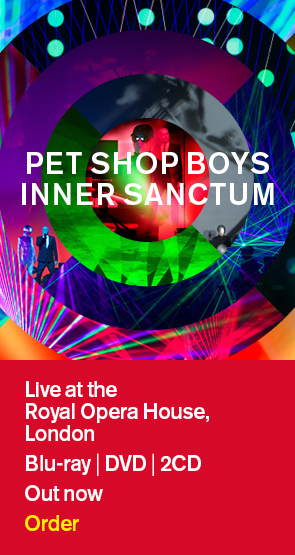 A special edition (full details in the earlier news story below) includes a DVD of Pet Shop Boys' performances on BBC TV and also their Glastonbury Festival performance from June this year.